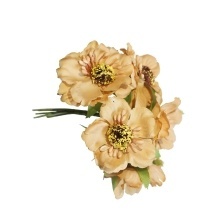 This artificial poppy flower is made of silk with purely manual process. It is sold in sets, each with 6 poppy flowers. Well made and vibrantly colored. They are perfect for indoor or outdoor decorations, such as office, bedroom, living room, coffee table, windowsill, bookcases and so on.